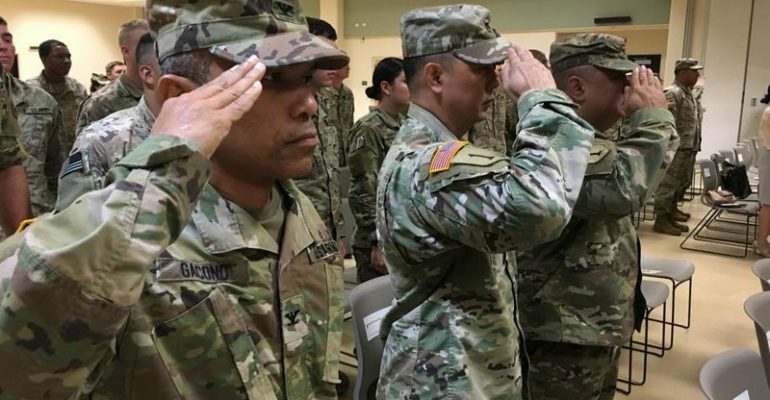 Ceremony to mark the transfer of the security mission for the THAAD site in Guam to Soldiers of Guam's National Guard on February 4, 2019. The United States National Guard is made up of soldiers and airmen from the 50 states and territories of the United States of America and are currently deployed and in operations to defend the United States of America from missile threats. It is a historic and critical mission that goes back to the citizen soldiers of the Revolutionary War in costal defenses. On Monday, a Guam National Guard unit assumed command to provide security for the site of the Terminal High Altitude Area Defense (THAAD) system deployed on and to defend the island of Guam at Anderson Air Force Base. This marks a first, where an Army THAAD unit, operationally deployed on U.S. territory, transferred command of security operations to a National Guard unit of the territory. Today there are multiple congruent state National Guard units from Alaska, California, and Colorado that man, operate, and defend our nation’s deployed Ground-Based Missile Defense System (GMD) in Alaska, Colorado, and California. There are also Air National Guard Units operating and providing security for our Upgraded Early Warning Radars (UEWR) at Clear Air Force Base in Alaska and Beal Air Force Base in California for the U.S. homeland missile defense mission. Added to the National Guard’s ballistic missile defense mission is the air, UAV, and cruise missile defense of the National Capital Region (NCR) in Washington D.C., which is deployed and operated by five different state National Guard units in annual rotation from (Florida, Mississippi, North Dakota, Ohio, and South Carolina). The Ohio National Guard’s 1st Battalion, 174th Air Defense Artillery Brigade will be defending the Capital during the State of the Union Address tonight. The National Guard, in matching the MDR’s intent, will have to expand its role in manning, defending, and operating the expansion of U.S. homeland missile defense that will help relieve over demanded joint military forces in the homeland defense of the United States. This could include the under layer mission and operationalizing of the Aegis Ashore site at the Pacific Missile Range Facility (PMRF) in Hawaii with the Hawaii National Guard, a potential third GMD site in the Continental U.S. with the respective state’s National Guard soldiers, and in the future potentially composite layered missile defense sites for basing in the United States and its territories. In addition are the air platforms of the upcoming F-35 being deployed in Burlington, Vermont this year that will be manned and operated by the National Guard. The MDR also has put forward the new upcoming land-based Long-Range Discrimination Radar (LRDR) in Alaska (2020) and a smaller version of the LRDR in Hawaii (2023), that could also be manned and operated by the Air National Guard.